The story begins with Harley and Ivy about to steal the rare Zombie Root plant from the Gotham Botanical Society. Ivy says she can use the plant to create a chemical that will turn anyone exposed to it into her willing slave. 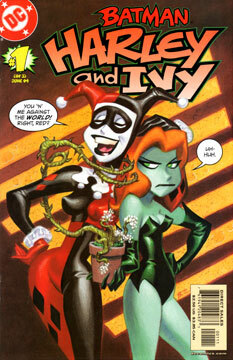 Unfortunately, Harley got the date of the Botanical Society’s event wrong, and Harley and Ivy are caught red handed. They run with the plant, but not before Bruce Wayne makes a change of apparel and gives chase. In the ensuing fight, Harley sacrifices the rare plant to save Ivy, only to be repaid with Ivy’s ire. Their escape is delayed, and Batman easily captures them. Back at Arkham, Harley repeatedly tries to beg Ivy’s forgiveness, but Ivy only has thoughts for ways to kill Harley. In due time, Ivy escapes, but leaves Harley behind. The next day, Ivy is on a cruise ship, leaving Gotham for Costa Verde. To her dismay, Harley shows up, offering to help. Ivy wants to leave Harley behind, but she is (apparently) touched by Harley’s admission that they are best friends. Ivy throws Harley a life preserver, and Harley is dragged along the back the boat. A strong first issue! The plot is established, there are plenty of great character moments, and it’s more than just one big chase scene. It’s a great slice of the animated world as viewed by two of its leading ladies. Fantastic! It’s Timm and Glines, so you know its good. Of note is the full-page panel of Ivy’s moss monster attacking the Arkham guards in the sewer. We often see Kirby’s influence in Timm’s art, but this one had Bernie Wrightson stamped all over it. Maybe Harley and Ivy in Arkham duds, but that’s about it.